Supporting small and independent craft brewers is essential to advancing beer — and you as a beer lover are a vital player in this narrative, even if you don’t realize it. Do you think retailers have this mantra top of mind on your behalf? Do large brewers? Who’d have thought small and indie brewers would drive innovation and the full-flavor beer movement to the level it has achieved and help so many of us embrace, relish, cherish and appreciate beer beyond words? This success will continue as long as consumer choice — our choice — not supplier push, is protected. However, right now, everywhere I look, the largest of large brewers are nipping at the heels of the hard earned success of the small and susceptible craft brewer and swaying some retailers to go exclusive and shed, or slim, their craft brands. There’s a machine in motion working to sway beer lovers into believing newly purchased and former independent craft brewers are still small. Need proof? 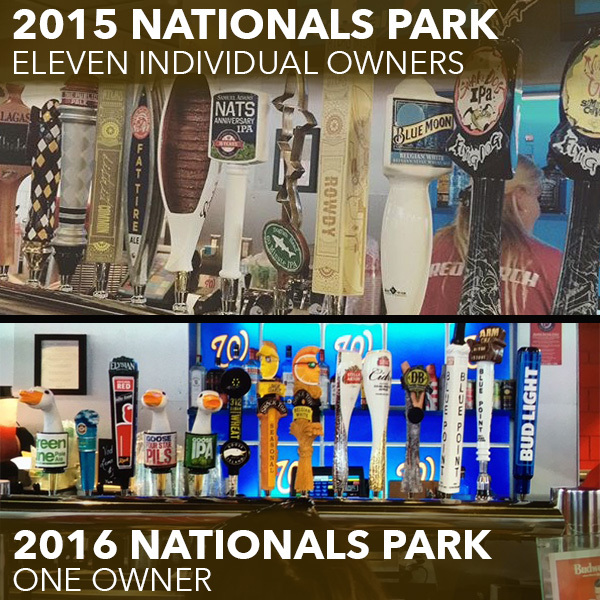 Take a good look at the two photos of the tap choices at a bar inside Nationals Park in Washington, DC. The photos were taken just one year apart — 2015 and 2016 — and in that single year, the draught choices for beer lovers went from beers by 11 owners to beers all from a single owner. Eleven owners to one in a single year. Let that idea soak in. That’s what we mean when we say “Illusion of Choice.” That’s what Executive Director of the California Craft Beer Guild Tom McCormick meant when he wrote this month, “Know who brews your beer.” That photo is not surprising, as I’m seeing this more and more as I travel the U.S. But why am I (and you) seeing this more and more? Is this acceptable and the best we can do as an advanced beer nation? The photos are a clear indication of the battlefields for Big Beer vs. small and independent breweries — and it’s not just stadiums. The fight for shelf space is being fought at your grocery store, your liquor store, the menu at your favorite restaurants, at concert venues and airports. Wherever exclusive rights can exist, they exist, slamming the door to the beer brands that had finally started to gain ground and see placements outside the portfolios of large brewers and large importers. Those photos from Nats Park are a glaring example of the changing times and we as beer lovers have a voice on this change. Small and independent brewers make up 99 percent of today’s U.S. breweries. While they are only responsible for 12 percent of the market by volume, ensuring their success is essential to innovation and diversity in beer as a whole. 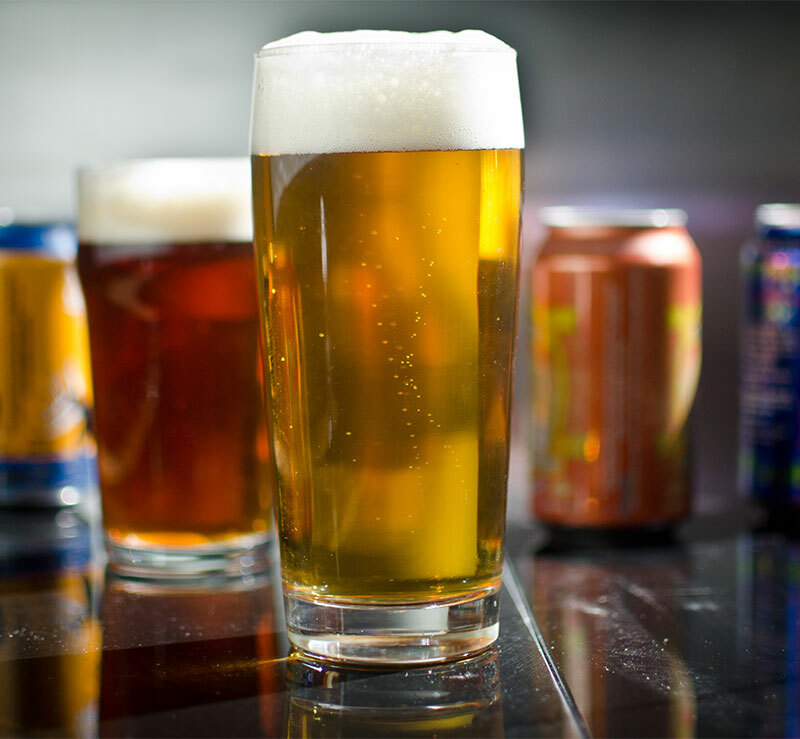 It is completely reasonable for beer lovers to want to see their local brewery included in the menu line up at retailers, but unfortunately, it is not guaranteed. The Brewers Association now documents 155 beer styles. It wasn’t like that before the craft movement. Today, 78.5 percent of adults of legal drinking age live within 10 miles of a brewery. The Brewers Association estimates more than 10 million people toured local breweries in 2014. 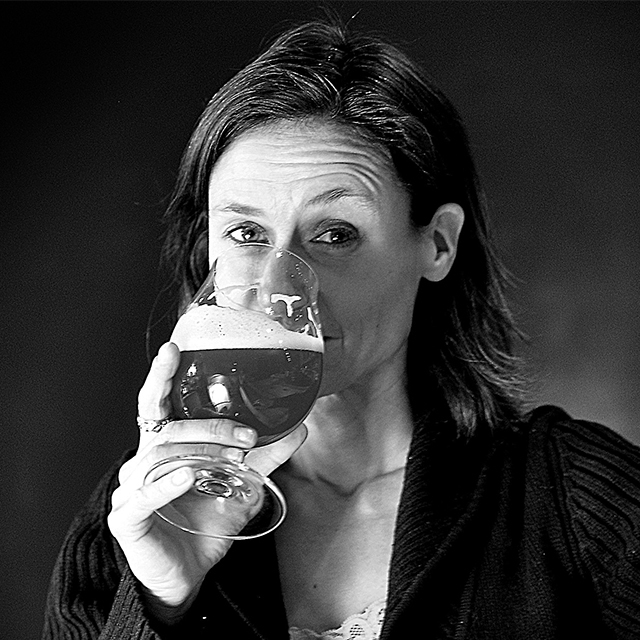 More than 70,000 people have tested into the Cicerone® program. Beyond that, think about the number of people graduating from brewing schools, chefs’ involvement in craft beer and the online educational resources on the beverage. This all bubbled up from, and when, craft brewers began to gain traction. Nearly half of craft drinkers said they drink craft with food more now than a couple years ago, according to a 2015 Nielsen survey; seventy-one percent of craft beer purchasers gave “complements my meal” as a very or somewhat important selection criteria in their beer choice when dining out. Think how much the beer menus have expanded at restaurants. This is all due much in part to the full-flavored beer movement and craft beer helping beer reclaim its place at the table. Craft brewers contributed $55.7 billion to the U.S. economy in 2014 and fueled more than 424,000 jobs. Our country needs every dollar and every position of employment it can get. In 2014, craft brewers donated an estimated $71 million to charitable causes, averaging $3.25 per barrel they produced. One report had AB InBev’s charitable foundation donating an average of only .35 cents per barrel. Look at how beer distributors now advance beer diversity and beer education in a way they never had before. This is a direct result of carrying brands from small and independent craft brewers. Any way you slice it or pour it, the entire beer community should strive to care for, champion, protect, preserve, defend, foster, grow, safeguard and support small and independent craft brewers. If we want the U.S. to continue to be the main and most diverse destination for beer on planet earth — and refuse to let the photo at Nationals Park become the destiny of retailers in America — we need to ensure craft brewers continue to carve out a spot on the shelf, on the menu and in the minds of retailers and beer lovers. The path to accomplishing that will be keeping access to market fair and open for all. What’s the bottom line for us beer lovers? It’s important to both beer diversity and small brewery businesses to have top of mind awareness when we’re buying beer from retailers. So don’t be shy to tell them what brands you want them to carry including those from small and independent brewers.